I wonder why Brooks considers this statement “courageous” and “provocative” rather than stating the obvious. Sanghi slams some CSR as just another form of the “’guilt complex’ - charity as a means of managing a potential backlash.” And surely that happens, as he points out, with oil companies and big tobacco. But when a company makes an operational decision that’s good for society, you can bet it’s also good for the business. And when businesses band together with competitors to address a societal ill, it’s because the very heart of capitalism is threatened, as it is with climate change. Will capitalists step up to climate change for their own survival? The evidence seems to say yes. We’ve all heard about climate-caused business disruptions – think Hurricane Sandy in New York and rising sea levels along the East Coast. But climate change affects both operations and consumer confidence. The latest Yale/Gallup/Clearvision poll found 62% of Americans are convinced that “global warming is an urgent threat requiring immediate and drastic action,” indicating widespread fear. Recall the stock market crash of 2008: when consumers are afraid, they don’t buy products and they don’t invest. As the impact of climate change gets worse, consumers may just stop spending. As temperature extremes worsen, they might just stay home. And consumers are rewarding climate friendly companies by buying their products and their stocks. The rest of business is jumping into action too. Just a few days ago, the Huffington Post reported that eleven environmentally responsible corporations including Bank of America, Goldman Sachs, Walmart, and Apple joined Obama in "American Business Act on Climate Pledge." The purpose of the climate pledge? To support a "strong outcome" at the climate negotiations in Paris and commit to renewable energy, emissions reduction, responsible water use and halting deforestation. Last year, even without the President’s backing, over 100 companies joined a coalition called We Mean Business to advocate bold action on climate change. Those companies were already climate leaders in their products (think electric cars and green investment funds) and operations. We Mean Business now represents $2.19 trillion in members’ revenue and $7.4 trillion of investment. Capitalism as practiced in 2015 America is a flawed system, distorted by years of legislation removing essential safeguards. But when it comes to climate change, capitalism might just be the most effective solution. Regardless of how weak you believe the connection is between profit and social responsibility, the connection between profit and public opinion has never been stronger. 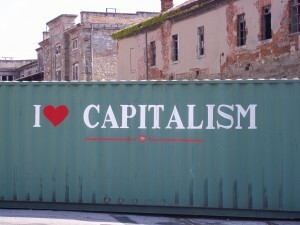 Add to that the economic opportunities presented in the course of addressing climate change in both operations and consumer loyalty — opportunities such as Ikea discovering a solar gold mine in its massive flat roofs and the UK’s Marks & Spencer’s impressive gains in reducing carbon emissions while successfully relaunching its brand as the sustainable retailer — and you’re seeing capitalism at its finest. Is This the “Era of CSR”? This number is truly remarkable! First, look at it in absolute terms. 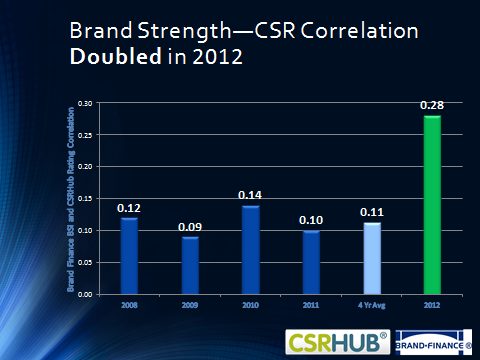 In 2006, I organized the first study that proved a relationship between CSR and brand existed at all. That study was considered such a breakthrough that I was invited to present the results at all the major sustainability conferences, from the Conference Board to SRI (Socially Responsible Investing) in the Rockies to the Wharton Sustainability Conference. All that excitement over a small, but significant relationship – a .05 correlation. That 2006 study – conducted just six years before the CSRHub study – barely qualified for statistical significance. 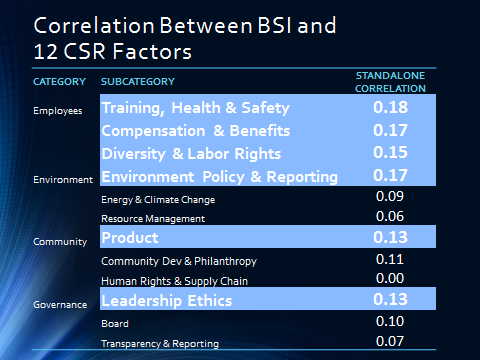 So the fact that the CSR/brand correlation reached .28 so fast is a very big deal. Of course, we used different databases back then. CSR outside the US wasn’t being tracked by US firms so our numbers were domestic only. The CSRHub study combined global data from Brand Finance, the UK brand value company, and CSRHub’s aggregated global information. Still, the rise was extraordinary. In fact, so unbelievable that CSRHub’s CEO Bahar Gidwani, a self-admitted geek with degrees in physics and astronomy and a Harvard MBA, tested every permutation of statistical error. The numbers hold. Look at the above chart again. 2012 jumps one and one half times over 2011. This is after years of languishing. Was 2012 the tipping point? If so, why? After waffling around during the grim days of recession and climate change denying, something pushed us into a new age of CSR. Maybe it’s just that CSR has finally traversed the natural path of innovation. The numbers from 2006 to 2012 form an almost perfect hockey stick-shaped graph of innovation adoption, starting from the 20 years or so before 2006 with consistently low level of “innovators,” increasing over five years through the “early adopter” phase and now blasting into the “mainstream.” But why now? Figge reported on the subcategories that carried the higher correlation. As expected, environmental factors had robust correlation due to the ubiquity of sustainability reports and environmental crises. But employee issues exerted an even stronger influence. Social media accelerated the impact of greater employee engagement and the accompanying word-of-mouth. I would argue that something else is also at play: a shift in culture from one tilted towards competition and force to one based on co-operation and kindness. Thanks to the environmental movement, our perspective is becoming longer-term and focused on preserving the commons, or the natural resources that we all share, rather than competing for them. Evidence of the shift is most apparent in the younger cohort. We’ve seen acts of violence drop by half since 1994 among 10-24 year olds. GenY is showing a preference for the “sharing economy” in industries from cars to hotels to homes. David Brooks wrote last week about a young hedge fund trader who lives on a grad school budget and sends the rest off to Africa to find a cure for malaria. 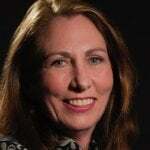 Surely “The Era of CSR” is upon us.